Today I did something scary, something exhilirating… challenging… exciting…moving. A bold prayer. Today I moved someone and was moved. In a matter of minutes, I gained the attention and applause of heaven. Just a couple minutes and God’s eyes were on me, His face breaking into a huge smile. Because of bold prayer. Let me back up. I worked today. I work at the office for my father-in-law part time. The first week of the month is a busy time, a time for collecting rent. Many visitors are in and out. On top of this, I had to take my 8-month old to work with me. (Talk about a decrease in work performance!) Towards the end of the day, a lady came in to pay rent. She’s a Christian woman about my age with 5 children and a husband that moved to Texas for work. I was tired and distracted, but I made conversation asking her about how their job search in Texas was going. I asked her about how life was going as she was sort of a “single mom” right now, and I knew that had to be very hard with 5 kids. Then I felt it. That little tug that you feel when God prompts you to pray for someone. Followed by…yep there it is-fearful butterflies. Oh! This is going to be uncomfortable. Maybe I don’t have to. She probably doesn’t even want me to. I should ask her. Just ask her. Deep breath. “Could I pray with you about that?” Her eyes lit up. Then her whole face lit up. Her shoulders relaxed like a weight had been removed. And I realized: what if I had missed this opportunity? This beautiful woman was walking around needing someone to comfort, encourage, and support her in prayer. She needed to feel God’s touch during this hard time. What if I had said no to God’s prompting? We say no so often to stay in our own comfort zone. But we never know when someone needs – REALLY NEEDS that prayer. I implore you. Get out of your comfort zone. We only grow in boldness by being bold. God needs us to be obedient to His prompts. 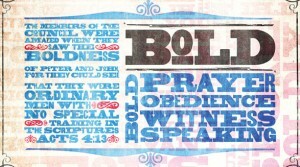 The world and other believers need us to obey with bold prayer. May the Love of God casts out all fear, and I pray that He will give you grace to respond to His desire by boldly praying for another whenever He asks (and even when He doesn’t. I don’t think it’s ever wrong to pray).